Coiled figure in Ancaster stone. Contemporary Sculpture has gained in popularity in recent years and is not only within the reach of the rich and famous. Not everyone can afford an Antony Gormley, a Damien Hirst or a Henry Moore, but there are plenty of people who are looking for contemporary sculpture at an affordable price, and my work falls into that accessible category, as well as appealing to those who are looking for works of art which are individual and of good quality. This is the time of year when we are all starting to think about the coming season – a time to refurbish our homes or get out into the garden to re-design, to replant or just look forward to days when we can spend our leisure hours enjoying the pleasure of being out-of-doors. Most people react positively to my creativity as it is based on the human form, simplified and abstracted, and depicts a range of emotions and relationships. 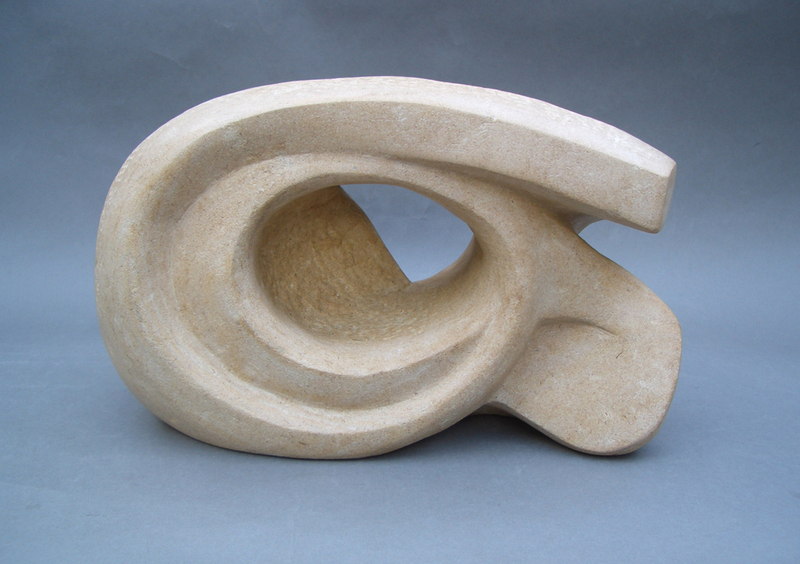 If you are looking for a contemporary sculpture to create a focal point in your home, there are stone carvings or cast pieces in a variety of sizes and finishes to suit all interiors. These look well in both contemporary and traditional settings and will fit into any room in your house or flat, from your living room, bedroom, study or even kitchen and bathroom. You don’t need to own a stately home with vast acres to be able to display an outdoor sculpture. Even in a small garden, patio or roof terrace, the effect of a small contemporary sculpture will give lasting pleasure and, as far as the siting of sculpture in a garden, there are no barriers. One of my sculptures can effectively create a focal point or even a surprise element when suitably placed; sculpture never detracts from the surrounding settings but will add to the overall impact. Selecting a piece of contemporary sculpture for your home or garden can be an exciting prospect. Many people find it easier to buy something ‘off the shelf” whilst others may have the vision, or some may say, courage to commission a sculpture from an artist whose work they admire. This might at first seem to be quite a daunting idea – most people ‘know what they like’ but cannot put this into words. With my experience and specialist knowledge I can help them crystallize their thoughts. We can thoroughly discuss the theme, design, material and scale, and an indication of the budget so that I can produce a maquette (small working model) for approval before a firm order is placed. Whether you want to commission a sculpture or buy one that I have previously created, in either case my sculpture may well fit the bill.